You can see the division throughout the radical changes in the work and worship of congregations. The division shows itself in changed definitions about what it means to be a Christian and, at the core, in differing ideas about the inspiration and authority of Scripture. Congregations, schools and other institutions previously following one religion have embraced a different religion. Their light has become darkness. What the church is going through today mirrors the crisis faced by the church in the mid-19th century. In those days, secular academic theories were applied to religious studies, especially by German theologians. Their approach adapted religious thought to fit secular intellectual fads. After the Civil War, this new approach to religion came to the United States, popularized by the universities of the Northeast and Midwest. Every major religious group was affected, but none as much nor as quickly as the Disciples of Christ. “Nothing indicates the wide departure from the landmarks of truth more clearly, that is taking place among those who started out to restore the ancient order, than the loose views put forth by some of the accredited teachers among them in reference to the authority of God. These show that the old standards have been set aside and new ones adopted” (Jan. 23, 1884, p. 49). What happened in academia in the 1800s is happening in colleges affiliated with churches of Christ today. This change is a crisis because once you change your view of Scripture, you change the very essence of Christian faith. What has been taught in colleges has entered congregations. Many church leaders, sadly, have changed their convictions about the truthfulness of Scripture, the authority of Scripture, and the significance of the Bible for the church. The doctrine of inerrancy is easy to state. If the Bible is the Word of God, it is free from error because God does not lie; neither does God make mistakes. It is just that simple. What you believe about the integrity of Scripture speaks volumes about your faith in God’s honesty and in God’s ability. Christians who continue to uphold the complete truthfulness of Scripture have kept their faith in God who has spoken through Scripture. Those who have abandoned their faith in Scripture have abandoned their faith in the God of Scripture. Your belief in the divine origin of the Bible leads you to accept the Bible as your authority in religion. If God has spoken, it makes all the difference in the world. The authority of Scripture is the practical application of the lordship of Christ. Jesus frames the question directly, “Why do you call me ‘Lord, Lord,’ and not do what I tell you?” (Luke 6:46). Those holding fast to their faith will submit to the authority of Scripture. Those who are embracing a different religion will introduce other sources of authority to justify the changes they put forward in the church. Without a common view of the inspiration and authority of Scripture, there can be no unity in the Lord’s church. For 100 years, from the late 19th through the late 20th centuries, our congregations were remarkably united in faith and practice because of a shared view of Scripture. When church leaders changed their view of the Bible, they were changing their religion. Two areas where the new religion shows its changed view of the Bible is in its view of the sufficiency of Scripture and in its view of the accessibility of Scripture. Changes in both of these areas distance God’s Word from God’s people. Often, even before full-scale disbelief appears, the Bible will be marginalized by leaders wanting to introduce nonbiblical elements into the church. Remaining faithful to the Lord requires that you follow the Bible as the only authority for God’s people. Drawing from a broad range of secular disciplines, alien ideas continually enter the Lord’s church. Rather than following the New Testament pattern for the church, these secular ideas mold the church to fit the pattern of the world. This dilution of biblical authority with secular additions often produces an apostasy of attrition, dimming the light of God’s truth into a compromised twilight. In a similar vein, church leaders who want to change the fundamental nature of our religion try to limit the accessibility of Scripture. They remove the Bible’s authority in the church by undermining the confidence that most Christians can read and understand the Bible. If reading and interpreting Scripture are reserved for an academic elite, members of this elite are free to make over the church of Christ into a religion that suits their fancy. “And God said, ‘Let there be light,’ and there was light,” Moses wrote in Genesis 1:3-4. “And God saw that the light was good. And God separated the light from the darkness.” The word of God separated the light from the darkness in the beginning, and it still does today. Our existence as a religious movement rests on faith in God who speaks to us through Scripture. If we lose this conviction, we will have lost the light of His presence. Without confidence in the truth and authority of the Bible, our faith will collapse into a dark and self-serving religion of our own creation. We will no longer be God’s children of light. We will be the world’s children of darkness. 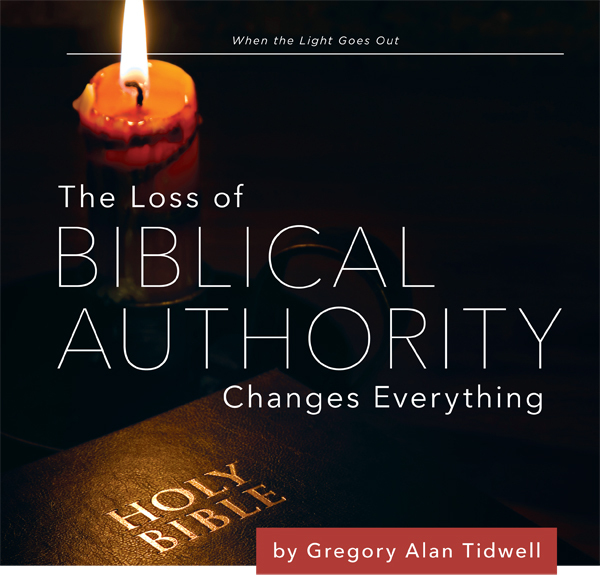 Gregory Alan Tidwell is the editor of the Gospel Advocate. He may be reached by email at greg.tidwell@gospeladvocate.com.